This show features Morgan, Saddlebred, Hackney Pony, Carriage and Open Divisions plus a complete Academy Rider division. PLEASE NOTE: USEF and AMHA now require that all exhibitors must be a member of AMHA or pay a non-member fee. We are also requiring proof of vaccination for equine influenza virus and equine herpes virus (see USEF General Rule 845), along with the usual Coggins and health certificates. Please present these at the entry office BEFORE unloading. BEN FRANKLIN $100 MYSTERY CLASSES! At the beginning of each session, a random drawing will determine which classes* from that session will be Ben Franklin classes. The winner of each Ben Franklin class will receive a $100 bill! *Junior exhibitor, in hand, equitation, championship and academy classes are not eligible. NOTE: We have moved two classes and there is a new version of the Prize List showing these changes. Please use the link immediately above to download. Friday, June 1, 10:00 a.m.
Friday, June 1, 6:30 p.m. ANNIVERSARY PARTY immediately following the session! 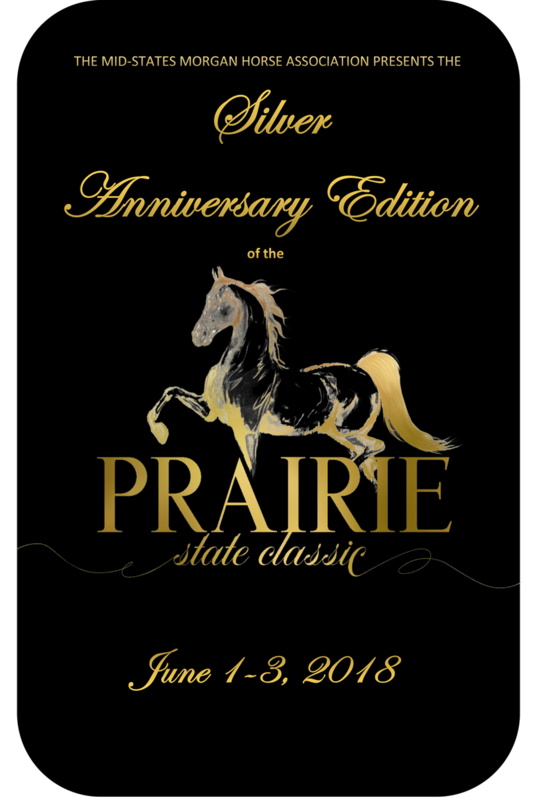 Food, cash bar, 1990’s music, trivia contest, prizes, sharing stories and pictures from the early days of the Prairie State Classic! Saturday, June 2, 9:00 a.m.
68. “Ride for the Paws” Stick Horse Class-All Children Welcome! Saturday, June 2, 6:30 p.m.
Sunday, June 3, 9:00 a.m. FOLLOWING CLASS 132, but not to start before 11:00 a.m. Submit at least $60 per qualifier class or $150 for championship class. Have at least three horses for the class. Request the class in a timely manner to allow promotion of it via website, email and at the show. Show management will make the final determination as to whether the requested class fits within the show.